Community activists, parents, the PHMC, Pennsylvania Department of Education, AIA Pennsylvania, and residents alike are banding together to save historic and neighborhood schools. 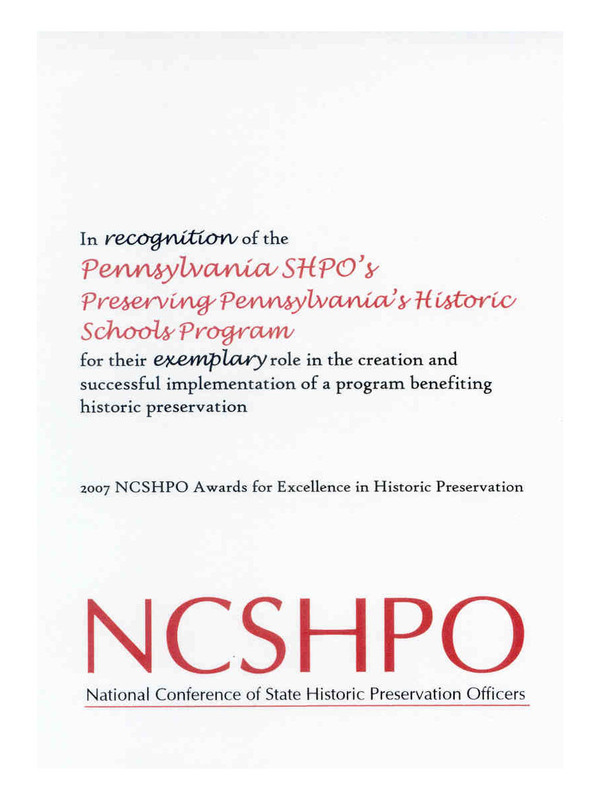 The PHMC's award-winning historic school buildings initiative includes the development of public programs and resources that encourage the preservation and continued use of historic school buildings. 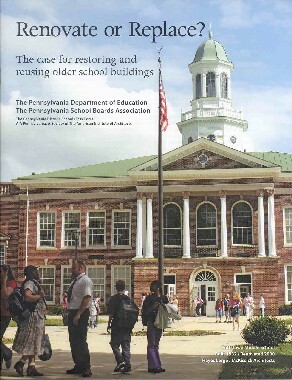 In addition to promoting historic schools through the PHMC's annual historic preservation theme and poster in 2006, a statewide survey of school buildings was completed as well as a narrative history of the development and evolution of public education from the colonial era to the mid-century. From one-room nineteenth-century schoolhouses to the sprawling post-war high schools of the mid-twentieth century, historic schools across Pennsylvania are threatened. Often such schools are ill-equipped technologically and unable to meet the requirements of current educational goals. Prejudice against older construction and its perceived limitations have caused school boards across the Commonwealth to abandon older buildings for newly constructed schools. Often these decisions are made based on misinterpretation of state education policies. The purposes of this initiative are to facilitate future nominations of historic school buildings to the National Register of Historic Places; advocate for the safeguarding of historic schools; and promote such buildings as important and vibrant parts of our environment. A calendar and review of events associated with this initiative will help you learn more about our activities and inspire ways in which you can be involved. Read the context statement: Historic Educational Resources of Pennsylvania, 1682-1969 (PDF). The booklet urges school districts to consider the social, environmental, and economic advantages of retaining older neighborhood schools when exploring the need for new or upgraded facilities. The booklet has been sent to all 501 school districts in Pennsylvania by the Pennsylvania School Boards Association and to 2,800 architects by AIA Pennsylvania, a Society of the American Institute of Architects. Copies are also being distributed by the Pennsylvania Department of Environmental Protection, the Pennsylvania Historical and Museum Commission, and Preservation Pennsylvania, the commonwealth's statewide non-profit historic preservation organization. The publication was edited by Tom Hylton. It was designed and published by Save Our Land, Save Our Towns Inc. with funding by the William Penn Foundation. Smart Growth Schools is an initiative that looks to promote the reuse of existing neighborhood schools, particularly if they are historic and also to promote the design of new schools that are compatible with the character of the neighborhood. The Smart Growth Schools initiative has been adopted by the AIA Pennsylvania Board of Directors as a theme to celebrate the 150th anniversary of the American Institute of Architects. The initiative included a wide array of public educational programs beginning with a radio campaign and web-based resources and ending with a charette that showcased the rehabilitation of a historic school building. 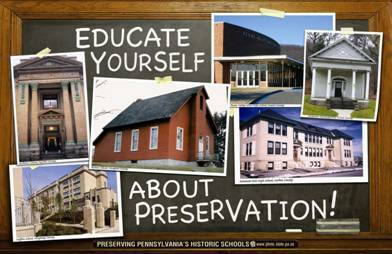 This is a static, archived version of the PHMC School Preservation website which will not be updated. It is a snapshot of the website with minor modifications as it appeared on August 26, 2015.